SAN FRANCISCO (Sept. 20, 2017) — San Francisco City Attorney Dennis Herrera and Oakland City Attorney Barbara J. Parker announced today that they had filed separate lawsuits on behalf of their respective cities against the five largest investor-owned producers of fossil fuels in the world. The lawsuits ask the courts to hold these companies responsible for the costs of sea walls and other infrastructure necessary to protect San Francisco and Oakland from ongoing and future consequences of climate change and sea level rise caused by the companies’ production of massive amounts of fossil fuels. The defendant companies — Chevron, ConocoPhillips, Exxon Mobil, BP and Royal Dutch Shell — have known for decades that fossil fuel-driven global warming and accelerated sea level rise posed a catastrophic risk to human beings and to public and private property, especially in coastal cities like San Francisco and Oakland, who have the largest shoreline investments on San Francisco Bay. Despite that knowledge, the defendant companies continued to aggressively produce, market and sell vast quantities of fossil fuels for a global market, while at the same time engaging in an organized campaign to deceive consumers about the dangers of massive fossil fuel production. The lawsuits filed Tuesday in the superior courts in San Francisco and Alameda Counties were developed with assistance from the law firm Hagens Berman Sobol Shapiro LLP. Like the tobacco companies who were sued in the 1980s, these defendants knowingly and recklessly created an ongoing public nuisance that is causing harm now, and in the future risks catastrophic harm to human life and property, including billions of dollars of public and private property in Oakland and San Francisco. Despite their knowledge of the scientific consensus on these issues, and despite warnings from their own internal scientists and/or scientists retained by their trade association, defendants continue to engage in massive fossil fuel production. They also continue to promote fossil fuels, and have developed multi-decade future business plans based upon increased fossil fuel usage even as global warming has progressed into a severe danger zone. Defendants’ contributions to global warming have already caused sea levels to rise in San Francisco Bay and threatened imminent harm to San Francisco and Oakland from storm surges. Sea levels will continue rising in the Bay due to defendants’ past, present and ongoing conduct, and this ongoing conduct exacerbates a problem that is largely irreversible. A recent state report, Rising Seas in California, projects as much as 10 feet of additional sea level rise along San Francisco’s coastline by 2100, which would be catastrophic. In Oakland and San Francisco, property worth billions of dollars is located six feet or less above current sea levels. In San Francisco, bayside sea level rise from global warming places at risk at least $10 billion of public property and as much as $39 billion of private property. San Francisco has already taken a number of steps to start addressing the problem. Those include creating a Sea Level Rise Action Plan, a precursor to implementing a long-term infrastructure plan necessary to protect our city against rising water levels. San Francisco has also integrated sea level rise guidance into our long-term city capital plan. 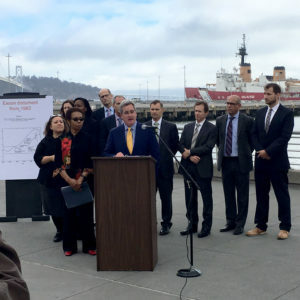 Sea level rise, storm surges and flooding threaten not only physical infrastructure but the safety, lives, daily way of life, sense of community, and security of Oakland and San Francisco residents. San Francisco is also extremely vulnerable to accelerated sea level rise and storm surges because it is surrounded by water on three sides. Sea level rise will disproportionately impact some of San Francisco’s most vulnerable residents, including those in the Bayview/Hunters Point neighborhood. It also threatens some of San Francisco’s most iconic and valuable buildings. For example, the Ferry Building would be temporarily flooded during a 100-year extreme tide today, but could be flooded every day after 36 inches of sea level rise. A significant portion of the combined sewer and storm water infrastructure on the west side of San Francisco is at severe risk of shoreline erosion caused by sea level rise. As a result, San Francisco has developed plans to protect that infrastructure at an initial estimated cost of $350 million. Shoreline erosion along Ocean Beach also threatens roads, pathways, private properties, and buildings along the shore. In Oakland, these disastrous consequences will disproportionately impact and endanger the lives and property of African American, Hispanic and other people of color as well as low income populations who reside in West Oakland and the flatlands of East Oakland. The 2014 National Climate Assessment, produced by over 300 experts and the National Academy of Sciences, specifically identified Oakland’s airport as threatened by sea level rise. The Oakland airport is more than a foot lower than New York-LaGuardia, which was flooded during Hurricane Sandy. Sea level rise and related flooding also imminently threaten Oakland’s sewer system. Rising sea levels imminently threaten to prevent water from discharging properly from the sewer system, which will cause sewage to back up and flood certain sections of the city. San Francisco and Oakland already have begun to suffer the consequences of climate change, although the most severe injuries by far are the injuries that will occur in the future — unless prompt action is taken to protect these cities and their residents from rising sea levels and other harms caused by global warming. Climate change models show large parts of San Francisco and Oakland, including the Oakland airport, under water within 100 years during storm surges. The lawsuits ask the courts to hold the defendants jointly and severally liable for creating, contributing to and/or maintaining a public nuisance, and to create an abatement fund for each city to be paid for by defendants to fund infrastructure projects necessary for San Francisco and Oakland to adapt to global warming and sea level rise. The total amount needed for the abatement funds is not known at this time but is expected to be in the billions of dollars.